I had high hopes. It could have been so cute. I still think it is cute, on the ground, lying flat. On me, it's not so cute. I even cut off about three inches and it is still not cute. I'm pretty sure 95% of my dislike is my fabric. But, there was a bit that I didn't like about the pattern. It was easy enough to assmble but I didn't like that the wrong side of the fabric could be seen when you walk. I didn't like the bow. Maybe in another fabric is could work but I see it mainly as being a waist clutter-er. If you wore it with a t-shirt, you would have to tuck it in, there is no way that a shirt would go over that knot gracefully. I put paper behind one of the pleats so you can see them. I changed the pleats so that the edge is folded over. 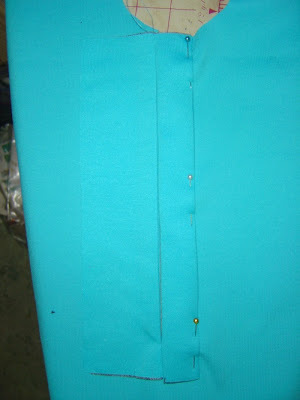 Here I outlined the pleats. This is different than the line drawing. I pleated mine differently so that all the fabric was not lying in one place. That made it very full in one spot. This distributes the fullness. I still don't like it. Crappy drawing, I know. This is where the bow would have been. I think I'm going to look for a simpler pattern for my mini-wardrobe. I'm thinking maybe 06/2008 #121. The lines are boring but I think it may be perfect for my fabric. I bought the damn snap press. You people pressured me into it. I am $8 in the hole because of it. And, I used August's money. I'm going to have to wait until September to spend money on sewing (read this post to understand my self-imposed $100 limit). Yikes, my husband is going to laugh over this. My $100/month limit is my own limit and he thinks I'm silly for imposing it on myself. Oh well. It is all about me right? Wait, I mean the kids. It is all about raising my kids and clothing them, right? Ruth has left a new comment on your post "Burda 07-2008-116 Empire Top": How do you do a SBA? I would like to sew something more for myself than skirts, but patterns are too big for me on top. Ruth: I'm not very successful with the SBA. I don't normally do them even though I'm an A cup. Once I realized I had to remove a half inch beftween shoulder and bust everything else just seemed to fall into place. I think this pattern does not lend itself well to the SBA. The bust ease is created by the gathers underneath the bust. You have to have that much ease so you can get the dress on and off. I have done SBAs before and have use this one from Shannon over at Hungry Zombie Couture. mycrew: I own the Viking 936 which converts to a coverstitch machine. This knit was so delicate that I carefully used my regular sewing machine to sew the neck. I have done it both ways with excellent results. Myra has left a new comment on your post "Jalie 2005 . . . sort of": Where is the fabric from? Myra: The fabric is from Gorgeous Fabrics. I seem to buy most of my fabric there. Ann has great stuff at great prices. I have a local boutique and they have great stuff but not much slection. And for those of you waiting for your patterns, they should be in the mail Monday. I might get a chance to put them in the mail this weekend but "fer shure" by Monday. Want to gain weight? I have the answer . . . I have the answer for those of you who want to look like you packed on the pounds: make a very busy print into a busy dress. This is, quite possibly, the worst length for me too. This is BWOF 06/2008 #122 (I would like to link to it but Burda doesn't have June in the archives section yet). This skirt is part of my mini-wardrobe so I wanted to muslin it. That post does have the line drawing. I'm not sure about it now. This is the dress in a lightweight stretch cotton. The description says, "lightweight skirt fabrics." I think they mean very lightweight. Here are the ties. They are already gone. They were not thin enough and they did not knot nicely. They just added bulk around the waist. Here you can see the gathers. Here are the gathers from the other side. There is a slit that goes up to about mid thigh. I don't like that when you walk, you see the wrong side of the fabric. We'll see if I can save this one. I plan on removing the ties, changing the pleating, and shortening it (a lot!). I think when I change the pleating I'll sew it down so that you don't get that flash of wrong side. If I decide to do it for my mini-wardobe, both sides look the same so it should be okay. I'm still debating. I may have to change skirts. My other thought was to cut the pattern so that the gathers are not straight like above. I'll have to draw a picture of it. But, it I cut the gathers diagonally, when you fold it, the pleats would form more of a wave effect. Yeah, I'll totally have to draw it because I speak no Engrish today. So I've been wondering what the difference was between the "old" Jalie 2005 and the new Jalie 2508. The 2508 is supposed to be the replacement for the 2005 pattern. The 2005 is a favorite at PatternReview.com with over 80 reviews. I was hoping that Jalie was not just repackaging the same t-shirt pattern so they could generate more sales. I have made the Jalie 2005 several times (maybe 7 times!) and was satisfied with the fit. It did wrinkle above the bust a bit but it was exactly like RTW and it wasn't that bad. I received Jalie 2804, the empire cross top, and decided that I should compare the two. I really, really love boatneck tops. Jalie 2005 has a boatneck version but the new version has a polo-type version instead. I decided to trace off the 2804 pattern using the boatneck pieces from the 2005 pattern. Turns out, there are some substantial differences between the armscye of the two patterns. The new Jalie has a very scooped front armhole. It is much shorter than the original t-shirt. These pictures are comparing front and back. These pictures are comparing the old and new in one picture. You can see that the front is scooped a lot more in the new pattern. The back is straighter in the new version. Here are the sleeves. The new Jalie is a bit wider and quite a bit more flat. And just FYI, that notch does not line up with the shoulder seam. It matches up to a notch on the upper back. Here is the resultant top. There are no above-bust wrinkles and it fits great. The new Jalies are also quite a bit longer than the old Jalies. I still have NL peasant blouses, NL skirts, S Easy Chic coordinates, B Lifestyle wardrobe for the taking. If you are listed above please email me your address: info (at) cabinbaby (dot) com. If things change, I'll update this post. I'm not sure that Jenaveve wants to pay that much for postage so those two patterns may still be up for grabs. Also to answer a question on the last post: They are all the smaller size range. Sorry that I forgot to include that information in the first go-around. Anybody want these? I'm a certified BWOF-phile. Well. I don't think I'll ever use these patterns so I will send them on to those of you who will. If you want them, just let me know, I'll send them to you free of charge as long as you live in the US. If you live elsewhere, and want them, you can pay me postage. First come, first served, take as many as you want. I just want them to be loved. Yes, it would be cheaper for me to throw them in the trash but I can't do that, it is like putting a book in the trash. Can't do it. I trace all my patterns so they are just cut apart but still intact. Some are OOP so I'll get a picture up in a few days. I made my son some pants and they turned out alright. I have long skinny kids and their pants are always falling down their butts. This pattern includes elastic in the waist so it was perfect. It includes a regular fly and tab closing. I used a bright orange zipper (orange is his Favorite Color) and a simple snap for the tab (I'm still comtemplating the snap press). Here you can see the back with elastic. 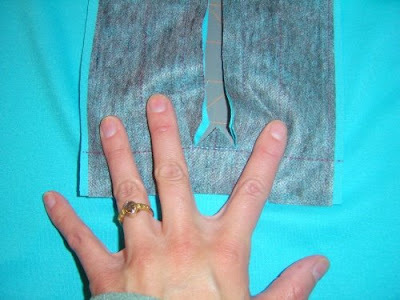 I added cuffs to the inside of the pants so that I can re-hem them out if he suddenly grows 4". In other news, I received some beeeee-you-tiful fabric from Gorgeous Fabrics. Can you tell I'm on a purple kick lately? Sheesh. 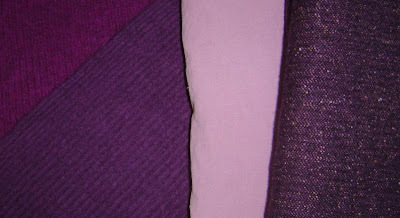 From l-r, sweater knit that is two-sided, 100% cotton that Ann calls cotton "Noile", dark purple tweed. I think I will use the brighter, pinker side of the sweater knit. The "noile" is kind of like linen. I'm totally not sure how to use it but I like it. The purple tweed is to die for. I will totally will be getting more of it for a suit or something. I love it! This is a close-up of the sweater knit. The color is more accurate in the first photo but the texture can be seen in the second photo. Here is my new and improved plan. Usually I am pretty good about planning it in my brain and then putting it on paper. Then I can really crank through the sewing. 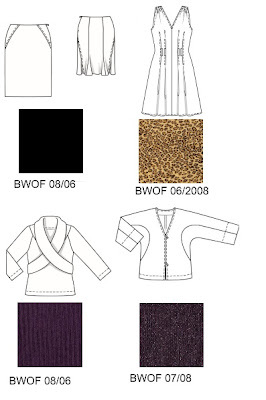 This time I am having problems settling my mind on so few patterns and fabrics. I am not a purple and pink kind of gal but these pieces just seem to go together so well. I like this plan better. I need to muslin the pants but I probably won't do a muslin on the skirt or sweater. BWOF fit me pretty well right out of the envelope. mycrew: We do have two JoAnn's which is where I buy some of my notions. For most other things (fabric, cool zippers, buttons) I am an online type of gal. Gorgeous Fabrics is my favorite place to buy fabric. I also like Fabric.com. I am gotten a couple of bum pieces from them but overall it has been really good. I'll put together a list of favorite online places for you. I love that top. I am wanting to make it. Do you make muslins before you sew? You always seem to be so successful. Rachel: For BWOF I don't ususally make a muslin unless it is a pattern where I am going to use very expensive fabric or I am concerned about the actual sewing. Burda seems to fit pretty well. If I am sewing the Big 4 (which I have given up on, BTW) I never know how it will fit so I usually make a muslin. Here is what I am thinking so far. 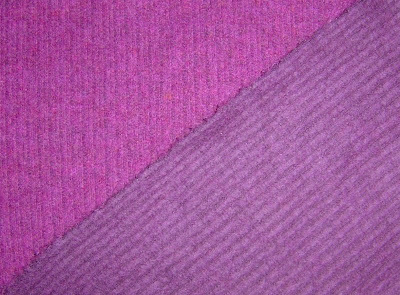 The two purple tops would go with the skirt and both could go over the dress. I am not sure I really like BWOF 07/08. I may have to go back through and find a different jacket; maybe something more fitted and structured (any suggestions??)? It is this fabric from Gorgeous Fabrics. She has the best stuff. The skirt would be black crepe I have in my stash. The leopard print is a stretch sateen I have already. The sweater knit is coming from Gorgeous Fabrics too. I think the purple sweater would look great over the dress and the necklines would work well together. I always screw up on the necklines. This time I made sure to keep that in mind while I was choosing patterns. You can tell that I should have done an SBA on this top. It is pretty baggy up on the top. Perfect shoulder fit! And these sleeves are not restrictive. I was worried after reading Christina's post about the other BWOF top but this one is fine. I chose to line the inside rather than mess with facings and binding the armholes. Make two bodices, hem the sleeves, attach them to the fashion fabric, sew neck edges right sides together, sew arm edges together (make sure sleeves are the correct way when you do this), turn right sides out and then sew side seams in one continuous loop. Grade, clip, press, press, press, and move on. There are two sets of drawstrings. One goes in the right, across the front and back and outside the right side. The other drawstring goes in the left, around the body, and back out the left. Super cute cottom eyelet lawn from my favorite fabric boutique. It used to be Three Sisters but it merged with another store and they are both called Seams Like Home now. Pattern Description: Nothing looks so fresh in summer as a crisp white blouse! Our trendy, tunic-styled version sports a typical empire waist with drawstrings dangling at the sides. Sizing: 34-44. I made a size 36. Did it look like the photo/drawing on the pattern envelope once you were done sewing with it? Yes, it looks like both the line drawing and the model photo. Well, mostly. I don't have a huge white hat but yes very similar. Were the instructions easy to follow? I didn't look at them much. I had to change the order of construction because I chose to line the bodice rather than use facings and bias arm finish. What did you particularly like or dislike about the pattern?It is a really easy top to make, even with the lining. In fact lining it probably made it easier than messing with armhole binding and those back facing I can never get to fit perfectly. The top is cute but pretty trendy with the empire waist so it probably won't last more than this season. No dislikes; it went together perfectly. Fabric Used: This cute Robery Kaufmann cotton eyelet from my local fabric boutique. They have good stuff but just not a lot of variety. I found Liberty fabric there and was amazed. It was quite spendy but you know, freight to Alaska makes everything expensive. 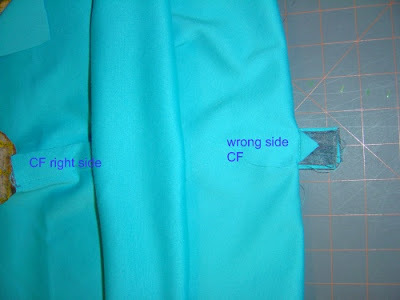 Pattern Alterations or any design changes you made: I did my usual 1/2" shoulder to bust tuck. I made my ties smaller because I have a bias-tape maker that takes strips that are 1" instead of 1.5". 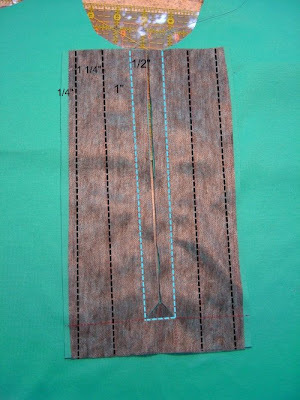 The casings that you create with the 3/4" seam allowances are not that big. I'm not sure that thicker drawstrings would have worked. I think you either need to increase the SA a bit or make your drawstrings thin like I did. There are two drawstrings; one that goes around and ends in the right side and one that ends in the left side. Here is a picture so you can see what I mean. Would you sew it again? Would you recommend it to others? I probably won't sew it again but I really like it. I word to ya'll with "girls". This top is very low and very wide. Seeing as I have no "girls" to speak of, nothing is going to fall out but without a camisole my bra was pretty visible. If I made this again, I would raise the neckline by about an inch. I usually do that with BWOF but I guess I forgot. You can see in this picture of the front that the bodice is a bit baggy. Conclusion: Cute and very easy. 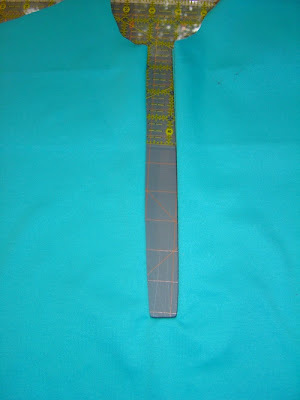 This is how I made my placket for my BWOF polo this time. I am using the directions from the Timmel website. Click there for some more directions. 1. 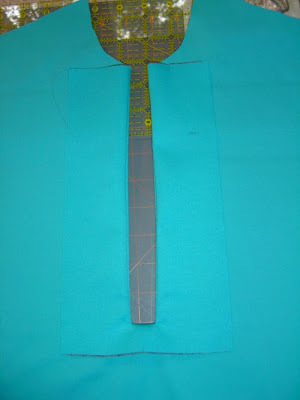 Attach a piece of interfaced fabric right sides together (RST) at the center front. I included the measurements in the picture below. Stitch a 1/2" around the CF leaving space at the bottom to clip the corners diagonally. This is important so you don't get a bumpy front when you flip the interfaced piece to the back. 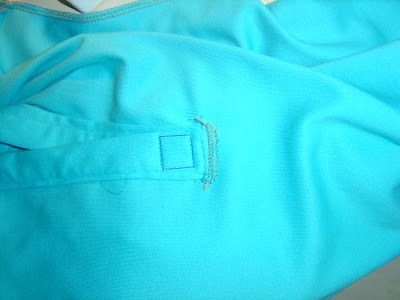 The teal is stitching lines. The black are just lines for references where you will fold later. 2. Flip piece to the inside. This is the showing the right side of the front. 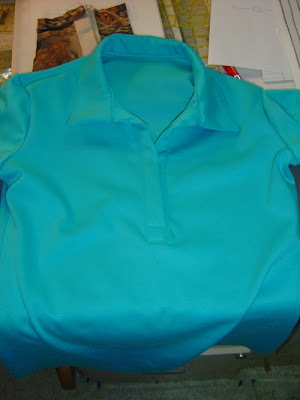 This is showing the wrong side of the shirt but the right side of the interfaced piece. Press well. 3. Now, starting with one side, fold it open again and re-fold on the next line out. This puts it back in the middle of the opening where it should be. I tuck under the 1/4" edges and pin them. You will stitch this later. If you look closely you can see the un-folded piece on the left. It is hard to show with this teal color. 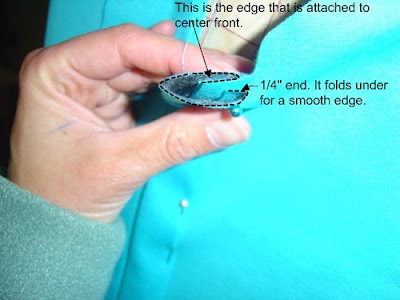 Here is the bird's eye view of the folds. This looking from the top of the shirt at CF. 4. Do the same to the other side. 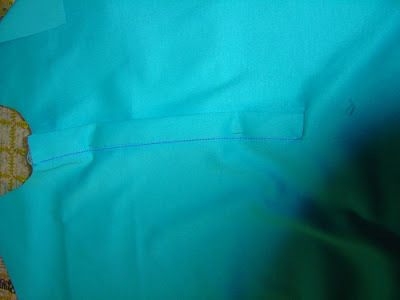 Pin carefully and topstitch (blue line below) both polo pieces as far down as you can. 5. Fold the bottom of the shirt up exposing the bottom of the placket. Stitch across all layers to keep them in place. 6. I finish off the bottom with my serger. I also sew a box at the bottom so the polot shirt does not go so far down. You don't have to do this but I like to. Do the rest like you normally do! Ta da! Polo! How Old is This Quilt Top? I'm on Fire. . . .